Dailybuzz.ch: 50 Cent Claims Beyonce 'Jumped Off A Ledge" To Confront Him Over An Issue With Her Husband Jay Z - "She bugged out at me"
50 Cent Claims Beyonce 'Jumped Off A Ledge" To Confront Him Over An Issue With Her Husband Jay Z - "She bugged out at me"
Rapper 50 Cent just fanned the flames that Beyonce and her husband Jay Z have a tendency to get thuggish at parties. While talking to Power 105.1 on Monday, the 38-year-old musician relayed a story about when the Sasha Fierce singer hunted him down to face him off at the Cosmopolitan in Las Vegas. Though the In Da Club singer never stated what Beyonce thought he had an issue with Jay over, he did hint she was very aggressive. 'She jumped out and I was like this, "What?! That Bonnie and Clyde for real! You try this or what, boy?! I’m here!" She bugged out at me,' he added. In mid May, 50 made fun on Instagram of the May 5 fight between Beyonce's younger sister Solange and Jay in an elevator after the Met Gal. The rap star had made light of the incident, which was caught on surveillance video from an after party, but quickly took the posts down. Solange was filmed attacking Jay Z in the elevator while Beyonce looked on calmly, not doing anything to stop it. 'Jay and Solange each assume their share of responsibility for what has occurred,' the family said in a statement after the highly-publicized footage leaked. In April 50 talked about his rivalry with Jay during a Sirius XM's Shade 45 radio interview. 'You need someone to work off; everybody does, wherever you’re at. It doesn't always have to be negative. I’m happy where I’m at, so why wouldn't I be happy where he is,' the artist said. He said he had something to do with Jay's initial retirement from rap after 2003′s The Black Album. 'You gotta say, "Where was Jay Z from 2003 to 2006?" I sold 23 million records between 2003 and 2006. He stopped making music and said I'm gonna go be the president of a record [company]. Like I quit,' the G-Unit CEO said. 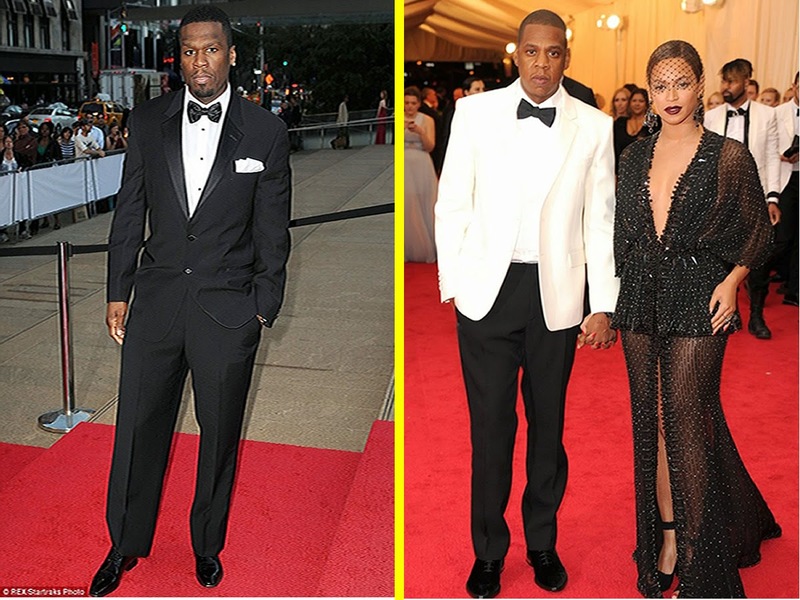 Fifty then pointed out Jay got more successful when he married Beyonce. The tension between Jay Z and 50 began in 1999 after 50 name-dropped Jay on his dis song How to Rob. Fifty toured with Jay in 2003 and 2007. Jigga appeared on a remix to Fif’s I Get Money single. 'First time I worked with an artist outside of New York was UGK, Bun B and Pimp C. So that was in ’98. We did a song called As the World Turns, it was a pimp record and then after I got shot, Jay did ‘Big Pimpin’,' 50 pointed out. 'I don’t know where he got the idea from? I don’t know, maybe if my record was like a pimp record maybe he got the idea from me, but I don't know where he got the idea from,' he continued, being sarcastic. Scroll to 37:00 for 50 Cent's Beyonce story.